Old Car Memories > Commentary > Has Ford Caught the GM Front-Wheel Drive Virus? It is official, Ford after tantalizing customers with its 2017 Lincoln Continental concept car has announced this all-new Continental will be produced on an extended front-wheel drive Ford Fusion platform. I had speculated 6 months ago that this was going to happen in my Why the 2017 Lincoln Continental May Be Doomed for Failure article. Usually it is nice to predict successfully a future event, in this case there is no joy. Ford which kept the full-size rear-wheel drive sedan alive for years – long after all the other American automakers threw in the towel and went front-wheel drive. The rear-wheel Lincoln Town Car was a staple among Florida retirees, big-business executives, and buyers who wanted a V8 powered American rear-wheel drive luxury car. Talk to any current or former Lincoln sales rep who sold these cars when they were new and they will all freely admit these cars were very popular with buyers. When the last 2011 Town Car left the factory floor, Lincoln just shrugged its shoulders as if it had not a care in the world. 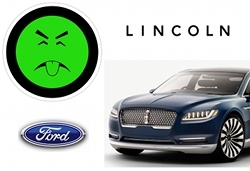 The sales figures since then say it all, Lincoln sales have slide into oblivion. Most buyers would rather be in a dentist chair getting the drill treatment than caught hanging out at a Lincoln dealership. Has Ford succumbed to the brain dead “every car has to be front-wheel drive” mentality? It was this mentality that transformed the nearly invincible GM decades ago into the much smaller company it is today in America – a brilliant idea that was hatched by the totally inept former GM head honcho Roger Smith. With this in mind it is truly a miracle that the Chevrolet Corvette and Camaro escaped this terrible fate and remained rear-wheel drive. To GM’s credit in recent years it has begun to see the light and the current Cadillac ATS, CTS, and soon to be released CT6 are all rear-wheel drive cars. Only took 30 years for GM to wise up. Unfortunately during this period Pontiac and Oldsmobile became causalities of GM’s front-wheel drive love affair. Even today GM has a long way to go, the Buick division could use a flagship rear-wheel drive car and Chevrolet could use a larger version of the low volume rear-wheel drive SS. Chrysler to its credit broke out of the front-wheel drive mindset when it introduced the 2006 Chrysler 300 which has been a very popular luxury car among new car buyers. Its Dodge division’s 4-door Charger has been a popular seller in the sporty rear-wheel drive full-size car market. 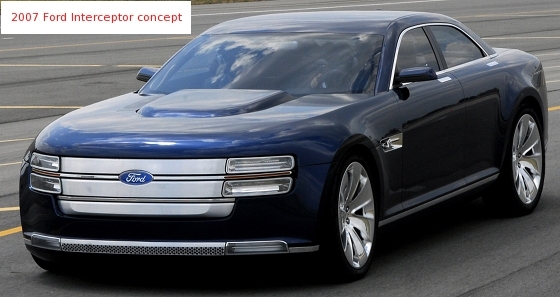 Ford seemed to be on-track to following Chrysler’s successful rear-wheel drive 300 when it revealed (to much praise) the 2007 Ford Interceptor concept car. The Interceptor had breathtaking exterior styling like the upcoming Continental. The overall flow of the exterior design was very similar to the Continental – both cars also have a long wheelbase. The Interceptor concept was built on a stretched rear-wheel drive Mustang platform and was equipped with a 600 horsepower 5.0 liter V8. Too bad Ford didn’t produce the Interceptor and a more luxurious Lincoln version based on the same platform. If it had done so a few years ago, Ford and Lincoln would have filled the gap left by the departure of the rear-wheel drive full-size Ford Crown Victoria and Lincoln Town Car. Lincoln sales would have been supercharged by an Interceptor based Lincoln. 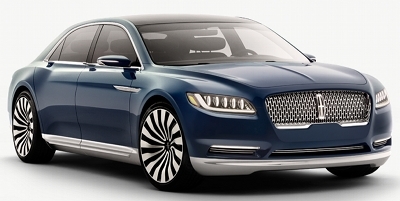 Instead Lincoln buyers for 2017 will get a front-wheel drive Continental with a 350 horsepower 3.0 liter EcoBoost V6. It is like promising Godiva chocolates but delivering M&Ms instead. The question is why is Ford so gung-ho on releasing a high priced front-wheel drive luxury car? The answer is simple, it is a half measure to save money. The money is spent primarily on the sleek exterior design and a flashy interior with beautiful luxury appointments while using an existing front-wheel drive platform (that has already been developed), thereby saving millions of dollars. There is a catch this only works if the customers are fooled by the pretty cake icing into forgetting about the cake underneath. The current front-wheel Lincoln MKS is an example of this attempt to fool the customers, it has failed miserably even when equipped with an optional all-wheel drive system. It appears at this time Lincoln may offer an all-wheel drive option with the Continental which will be a system that would be primarily power the front wheels. Cadillac recently played this no-win game. GM saved some money with its current full-size front-wheel drive XTS model (also available in all-wheel drive) which hasn’t been the big hit Cadillac had hoped for and will be superseded by the upcoming full-size rear-wheel drive CT6. This is why BMW, Mercedes, and just about any other formidable luxury car brand would never offer a mid-sized or full-size luxury car with front-wheel drive. Some buyers of these luxury cars will purchase in smaller numbers an all-wheel drive variant but these are all-wheel drive systems that send at least 60% (usually more) of the engine’s power to the rear wheels. Ford forgets luxury car buyers are among the wisest consumers, after-all if someone has $60,000 or more to spend on a new car this person tends to have excelled at a lucrative career or made wise monetary choices along the way. Ford believes that such a buyer will be fooled into buying a $60,000 front-wheel drive luxury car because it looks the part. Unfortunately for Ford that will not be the case, the Continental will be perceived as nothing more than a pretender in the luxury car market. Buyers will spend their dollars for other full-size rear-wheel drive luxury cars. I am sure Ford will balk at this prediction but luxury car buyers spending more than $45,000 demand rear-wheel drive cars. The Continental is going to be as popular in the luxury car market as a front-wheel drive F-150 would be in the pickup truck market – a modern day 1980s Yugo. The Continental will attempt to be the Toyota Avalon of the luxury car market, a full-size car built on a stretched front-wheel drive platform. It works for the Avalon since its base price is only around $32,000 however Toyota’s (luxury oriented) Lexus division would never pull this stunt, its full-size LS model is standard with rear-wheel drive. Ford has officially caught GM’s front-wheel drive virus (just as GM seems to be healing from it). It may be a long time before a new rear-wheel drive Lincoln makes another appearance and on the flip side of the coin the Continental could be Lincoln’s last new car before the division goes the way of Mercury. It is not a pretty picture. Whichever way you look at it the front-wheel drive Continental is going to be a big blunder – how costly the blunder will be is the only mystery remaining in this sad story.